Our school offers in-demand courses such as the Bachelor of Medical Science and Doctor of Medicine (BMedSc/MD) and Bachelor of Psychological Science and Business. With a strong international reputation, we continue to form new alliances with top universities around the world. The Medicine program is designed to produce highly competent doctors. They are patient-centred, work-ready professionals, who are reflective, compassionate and committed to lifelong learning. The course provides a similar learning experience to the equivalent courses, offered at Monash’s Australian campuses, and the selection criteria, learning objectives and assessment are the same. The Bachelor of Psychological Science and Business and the Honours degree of Bachelor of Psychological Science and Business (Psychology) provide students with the tools to succeed in a business environment by giving them a thorough understanding of business principles, and human behaviour and thought processes. Contact the Jeffrey Cheah School of Medicine and Health Sciences for more information about course accreditation, staff contacts and school events. 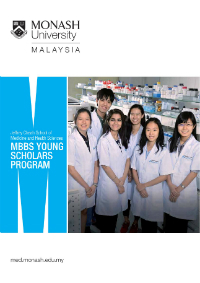 The Young Scholars Program (YSP) offers unique experiences to the most outstanding aspiring medical students even before starting the Bachelor of Medical Science and Doctor of Medicine (MD) course.